Vintage Singer “Penguin” Walking Presser Foot No. 160741 for Family Lock-Stitch Machines with original box and manual. It is easy to use and “waddles” like a penguin when in use. Thus, the nickname “Penguin Walking Foot”. The Singer Sewing Skills Reference Book says this “in an essential for the woman who demands perfection in her work, yet is interested in time-saving methods.” This delightful book is one of the very few produced by Singer which includes instructions on how to use the penguin walker. 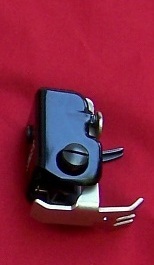 Penguin walkers were produced with either a chrome attachment screw, as shown below, or a black attachment screw, such as the one shown at right. This is a highly collectible and adorable item. Note: Google Checkout provides a smooth, secure transaction. If you wish to purchase more than one item, simply enter your personal data for the first item and click on “buy now” for each additional item. Inventory is updated daily. Items are available on a first come, first-served basis. Your credit card will be billed if item is still available. You will be notified when item is shipped, usually within 2 business days.